Practical Action is a charity working to increase people’s access to energy through low-cost ‘off-grid’ electricity supplies. DesignSpark bought together 15 engineers to explore news ways of delivering electricity and optimising the use of it. They called it Power Hack! I was one of 5 members of Team Faraday. 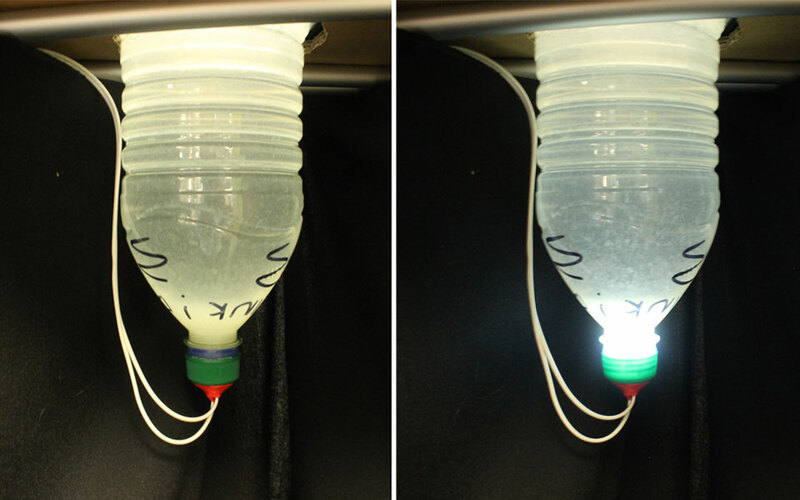 We has read about the Brazilian engineer Alfredo Moser, who has discovered that by adding a few capfuls of bleach to a few litres of water, this makes it ‘glow’ when light passes through it. He exploited this observation by placing a bottle halfway in/out of his roofing, so it would take sunlight and illuminate his workshop. Realise how cheap and effective this was, he took the idea around many developing countries to help people in need of light inside their homes. Alfredo did this some years ago, at a time when electricity for lighting would most likely have to be mains. 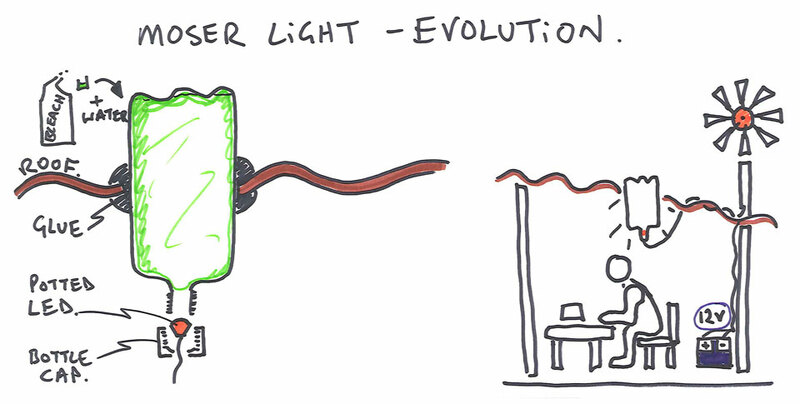 Since then the cost of LED lighting has made it a globally accessible technology – so we realised we could combine these two technologies to create a Moser Light which would also function at night, giving a soft diffuse light, rather than a glaring point of light which is typical of many LEDs. We realised that in many developing countries, people have to innovate with simple materials and recycling and reusing are essential, not just ethical. Realising we should champion this abundance of technical ability (if you’ve ever seen some of the hand-made tin-can cars sold at markets, you’ll know what I mean), we proposed not only for local people to design their own turbines (wind and water power), but to also build small enterprises around this. Initially aid organisation might need to assist with some of the basic tools, equipment and know-how, but in time it is hoped that this would encourage self-sufficiency and reduce dependency on aid for support. Top Left: We began by testing out the Moser Light principal with bleach and water, and also found a way to glue the LED in the bottle cap. 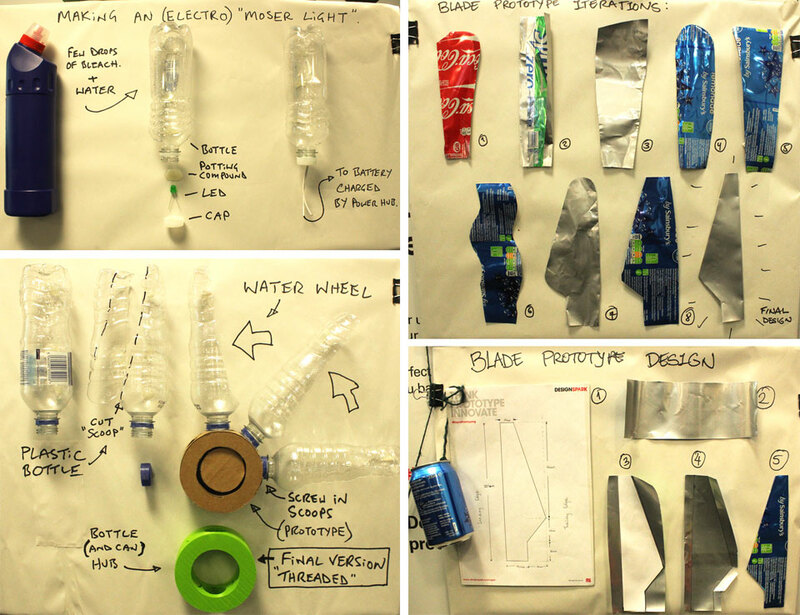 Bottom Left: Showing how a plastic bottle could cut to a ‘scoop’ shape for a water wheel. The ‘Hub’ would be threaded for all sizes of bottle, but also had ‘slots’ to which tin-can turbine blades could be inserted (see Top Right) for win-power. Final design is shown Bottom Right, though we suspect this design will be greatly improved on by local craftspeople. We disassembled a Wind-Up Torch, and built the mechanism into a new structure to house the Hub. This is of course very large and could be reduced in size for cost and efficiency. The prototype itself was made using Correx and my Card Rabbet Tool, which was strong and waterproof, as well as only taking a couple hours to realise to this level. After two days, this is where we got to with the concept and prototypes. Watch the video of the presentation, below. One of the real pleasures of these two days, was the teams who were involved. All has taken holidays to be here and almost all had never worked together before. Certainly for the team I was in, the atmosphere was fun, creative and committed. It is not always a given that one has the fortune of teams ‘gelling’ like this and various tasks falling neatly to each individuals particular skill-sets. I’m excited by the prospect of future workshops like this – and of course Practical Action is working hard to take at least one of these concepts to market, with the support of all of use developing it further. Team Faraday, Team Kilby, Team Maxwell. Check out our projects on DesignSpark’s blogs. And of course, last but not least – another salute to Alberto Moser, who’s insight, creativity and ethos was a true inspiration. We hope that our contribution might prove a viable and useful enhancement to an already life-changing innovation. You will see the Moser Light is featured by many different organisations, such as Liter of Light.He has not asked for any IP on this invention and freely allows others to implement his work for the good of others. Similarly, Practical Action and DesignSpark hold no claim on any of the designs and openly encourage external support, ideas and critique.